The text was updated to include approval of the article by the House of Representatives. 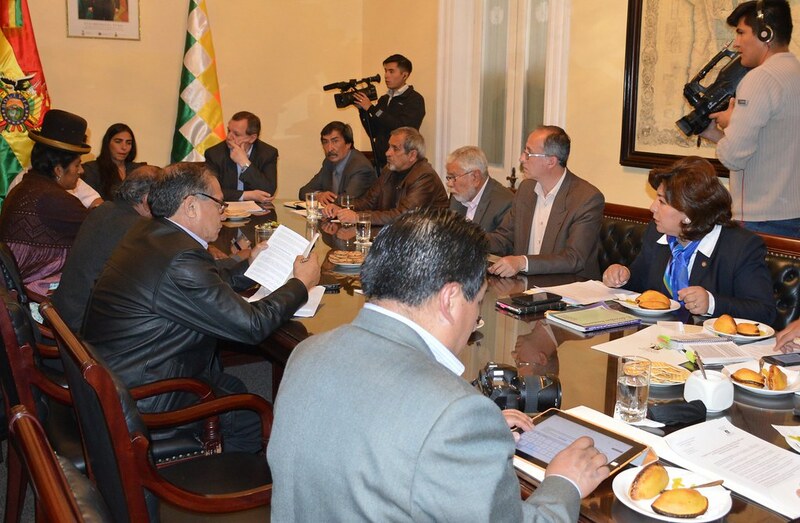 After meeting with media associations and journalists in Bolivia, the leaders of the country's legislature decided to exclude press professionals from controversial Article 200 of the new Penal Code, which sanctions bad professional practice. Representatives of the National Press Association (ANP for its acronym in Spanish), the National Association of Bolivian Journalists (ANPB) and the Trade Union Confederation of Bolivian Press Workers (CSTPB) met on Oct. 10 with Gabriela Montaño, president of the Chamber of Deputies, and Alberto Gonzales, president of the Senate. “We have achieved a rewording of article 200 that definitely excludes journalists and press workers from any risk of being prosecuted through criminal proceedings,” said ANPB president Pedro Glasinovic, according to ANF. The president of the Chamber of Deputies, Gabriela Montaño explained that the article now included “a paragraph in which it is clearly established that this [the new classification] is only applicable for those professions that have the duty of care in relation to the physical integrity and health of people,” La Razón reported. Marcelo Miralles, president of ANP, also said that there was an agreement with parliamentarians to include a new article in the Criminal Code, 192, to sanction crimes against freedom of expression and press and ensure the protection of both. “The Political Constitution of the State provides for these two protections, freedom of expression and freedom of the press, and free access to communication, both considerations made by the Constitution are now included in the draft of Penal System Code," Miralles said, according to Jornada. Entities and media professionals protested against Article 200, part of the reform of the Penal Code currently underway in the country. The law, which originally referred only to medical professionals, had been drafted to sanction "recklessness, negligence, malpractice, non-observance of protocols, regulations or duties inherent to the exercise" of any profession. At the end of September, ANP issued a statement saying that the approval of such an article "would have dire consequences in the journalistic field, where self-censorship would be imposed, while all Bolivian citizens would be subject to prior censorship in the diffusion of ideas and opinions." The association also emphasized that article 200 “would violate the constitutional principles and the Press Law that protects the exercise of journalism" in the country. Héctor Aguillar, CSTPB executive secretary, said that at the meeting with the parliamentarians, “the full force of our Press Law, which is a fundamental element of protection that we develop every day,” was ratified, Jornada reported. Article 200, with the wording excluding press professionals, was approved by the Chamber of Deputies of Bolivia on Oct. 17, La Razón reported. Bolivian media call attention to bill that opens possibility of sanctioning journalists’ "recklessness"